How Can Mung Bean Make You Feel Great? The humble and bland little bean is your passport to enjoy the rich and exotic flavors of India. Mung bean is a versatile legume that absorbs flavors of other spices and herbs, retaining their purity and vibrancy. They offer a mesmerizing bellyfull of contentment; a bowlful of satisfaction that could become addictive. While it fills your belly you'll also enjoy many health and nutritional benefits. Mung beans and kitchari have a long history of food and medicinal use throughout Asia and have now made their way into kitchens here in the United States and are gaining widespread popularity. Are you feeling lethargic and tired? Do you feel bloated or have irregular bowel movements? Do you often see a thick white coating on your tongue? These are signs you may need a detoxifying cleanse with mung beans. The pastiness of mung bean is your cue to its cleansing action - a hint of the soluble and insoluble fibers in mung bean that literally scrape your colon clean. But it's not the only sign of mung's cleansing properties. Place a teaspoon of uncooked mung dal on your tongue. Within a minute, you will notice a dry, rough sensation in your mouth. This sensation is called astringent taste in Ayurveda. The astringent taste of mung bean helps tone your digestive organs. Along with fiber, astringency helps to purge mucus from the bowels, rooting out toxins and parasites that may be lodged in your gut. Want to experience the cleansing and revitalizing properties of mung bean directly? Try kitchari. Simple and easy to make at home, kitchari features rice, a legume, ghee or oil, salt and spices. You may also add greens such as kale, vegetables like potatoes and squashes, or garnish with cilantro and coconut flakes. Popular kitchari spices include ginger, cumin, cayenne, cinnamon, fennel and asafoetida. To cook kitchari, boil the mung beans until soft. Fry the spices gently in ghee or oil. Then add all the ingredients to the mung bean broth, simmering until the rice is tender. Add mung beans into your regular meal plan by replacing lunch and dinner with a hearty serving of mung bean kitchari once a week. Monday's are often the most convenient day for a kitchari fast, as you may be more motivated after a weekend of rich and heavy foods. You will benefit from increased energy, improved metabolism, regular and healthy bowel movements and reduced signs of constipation, as well as an overall boost in your immunity and general feeling of wellbeing and vitality. For enhanced cleansing, you can extend your kitchari fast (also called kitchari mono-diet) for 1-10 days. Time any type of cleanse for when you're not too busy or distracted and keep a thermos handy so you can enjoy your kitchari at work. During your cleanse, minimize or eliminate rigorous exercise, refined sugars, alcohol, and cold beverages. Replace rigorous exercise with walking or yoga, and replace beverages with warm water and / or herbal teas. If you have a hectic lifestyle, you might find yourself surviving on overly rich, processed foods, old food, and poor eating habits, which leads to a sluggish and overburdened digestive system. While preparing your meals fresh daily may be difficult, once you gather and master a few good recipes in your cooking arsenal, cooking fresh food every day can be a great tool to reach your wellness goals. Kitchari is an easy way to enjoy fresh food. For best results, make kitchari fresh daily although one-day left overs may be okay if your digestion is strong. Keep in mind that leftover food loses its "life" quickly. Reheating (and freezing) can destroy many of the nutritional benefits. Emotional stress, environmental toxins, harsh seasonal changes, illnesses, extended travel, overworking, and irregular activities can also leave your digestion in a weakened state. A simple mung bean kitchari can help reset your digestion, as well as stimulate your digestive powers so you can feel lively and light. A kitchari fast also gives your digestion a much needed rest from the assault of rich foods characteristic of modern lifestyles. Use dehulled beans whenever digestion is weak, as bean skins are difficult to digest. Mung beans can help restore your bowels after a bout of food poisoning. Their cooling nature reduces inflammation in the digestive tract. To enhance their cooling effect, garnish with cilantro. Mung bean's fiber and astringency can help bind up loose stools in diarrhea. Mung bean kitchari is a restorative for those recovering from any illness. Literally it is the vegetarian equivalent of Grandma's proverbial 'Chicken-Soup'. Plus, it reintroduces the simplicity and austerity of wholesome, great tasting food. Mung beans are a low-calorie, natural choice to help you overcome the hardest challenge of weight loss: curbing your hunger pangs and keeping your cravings quiet. How many other ingredients can boast comfort and satisfaction while restoring lightness to your step and clarity to your mind? The high fiber content in mung beans aids in cholesterol reduction and lowers blood sugar levels. Plus, mung beans are a mild diuretic which helps to reduce excess water weight. They are especially useful for edema in the lower limbs. To enhance their durietic effect, prepare them with diuretic spices like cumin, coriander and fennel, or celery and parsley. Like most legumes, mung beans contain difficult to digest saponins. They are also high in potassium, a diuretic and astringent. They contain vitamins A, C and E, folacin, phosphorous, magnesium, iron and calcium. They are also a source of phytoestrogens. Mung beans (often spelled moong) may be found in Indian or Asian grocery stores. Mung beans with the skin are green. Split mung beans without the skin are yellow. Green mung beans with the skin intact can be sprouted, while the hulled, split variety cannot. We recommend split mung beans for those with weak digestion, and sprouted mung beans for improved nutrition if you can digest it without gas. Like most legumes, mung beans contain difficult to digest saponins. Fortunately, saponins are water soluble. To reduce saponins, soak the beans overnight then strain the water the following morning. Or, boil for ten minutes until the water turns sudsy then strain. You may also follow these techniques to improve digestibility and reduce gaseyness in beans. Browse Recipes Mung beans can be spiced in countless ways. They are simple to cook, cost-effective, and versatile. They are most often cooked into a soup (or dal) in India. Or, they may be ground with rice to a thick paste and fermented, then fried into a delicious thin pancake known as a dosa. The fermented paste may also be used to make idly, a tasty dumpling served with rich yogurt sauces. In Indonesia, mung beans are also featured in sweet dishes cooked with coconut milk, sugar or jaggery, and ginger. For the Chinese, drinking a bowl of cold sweet mung bean soup is an every day habit in summer - it's a delicious dessert with medicinal properties that cool down your system in the heat. In China, sweet mung paste is also frozen into an ice-cream. Is Mung Bean Good for Me? Find out by taking this free, easy quiz. You'll learn your body type, and whether Mung Bean is a good fit for you. Time to complete: approximately 1 minute. Mung Bean is recommended for Summer. Check out these other Summer foods here. Do you like 'mung bean'? Why or why not? What makes it unique? Is there something you'd like to know about 'mung bean'? I just received a 25 pounds order of split mung beans from my local co-op. The color is a green/yellow mix since some of the skins are still on. So, even though these beans are split, there is still alot of green and skin. Will they still make a healing ayurvedic food? They are still healing but the skins are harder to digest (ie. gasey). Often time when I soak split yellow mungs over night - next day they appear sticky and hard and are harder even after boiling. Not soaked are OK. It looks like theyr astringency increase and they stick together. What can be wrong? Is it ok to use sprouted mung beans in kitchari? What is hing and where do you get it? Same question as above. Is it OK to use sprouted mung beans & if so do you need to soak them? Also the same question for nuts. If they are sprouted is there a need to soak them? Cooked sprouted mung bean is better digested than their hardened versions. 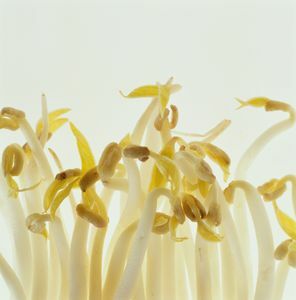 Sprouting activates digestive enzymes in that are otherwise not available when we cook the hardened ones directly after soaking.So yes, sprout mung beans are easier to digest. But make sure even sprout mung beans are cooked. Eating them raw regularly might constitute even those with agni!